Warners disgracefully shoddy take down request generator asks Google to de-list its own website. Leaked EU Copyright Directive ignores ordinary internet users, presents limited reforms to support creators, researchers, teachers and librarians; while providing a sledgehammer of protectionist measures for the incumbent news, music and film industries. Several documents have been leaked from the European Commission providing a clear picture of the proposed reforms to copyright that will be presented later in the year. The picture is quite negative as the proposals range from the timid to the openly regressive, such as the introduction of a new ancillary right for news publishers. Several key initiatives have been dropped, including changes to the current exceptions for "freedom of panorama" that allow taking pictures of public art and buildings. The new directive will complement and not replace current legislation such as the Infosoc Directive, although there are some minor technical modifications. Existing directives will not be reopened for discussion, thus limiting the possibilities for reform in key areas such as Digital Rights Management. The directive applies to the European Economic Area (EEA) and will probably be relevant to the UK whatever shape Brexit eventually takes. These leaks make the past two years of pre legislative discussions about comprehensive copyright reform feel like a waste of everyone's time, except of course for a few industry lobbyists. The EU is about to throw away the first chance in over a decade to adapt copyright to the digital world, instead choosing classic protectionism for incumbent industries. These measures will not promote the creation of a vibrant digital industry in Europe capable of standing to Silicon Valley - as EU policymakers want. Below we summarise the main contents of the leaked Directive. There are other initiatives in the wider package, including: a Regulation for online broadcasting, implementation of the Marrakesh treaty on accessibility for the visually impaired, a broad package on copyright enforcement and more provisions to promote European works. The contents of the Directive are a potpourri of initiatives that include some mandatory limited exceptions for culture and education and measures to help improve remunerations for creators, but in the main are openly about supporting right holders and European industry. This is the most controversial "reform": the creation of a completely new intellectual property right that lasts for 20 years specific for news publishers, which adds a new layer of complexity to internet regulation. The new right has the same scope as rights of reproduction and making available and it's covered by the same exceptions, including criticism or review. The EU is open in aiming to support the financial sustainability of news publishers, and the right does not cover scientific or academic publishers. We are not completely clear on the situation of blogs, but the right is meant to cover only publications by a "service provider". This right is meant to stop internet news aggregators to simply copy a portion of the news article and stopping revenues flowing to the original site. Similar initiatives in Germany and Spain had a disastrous effect on media access, but we will need more time to fully understand how bad this one is. The first analyses are extremely negative as the new right seems even less constrained than previous initiatives. Another major concession to industry aiming to address the "value gap" created by the disparity between the number of people watching content in platforms - basically Youtube - and the revenues received. The Directive forces relevant online platforms to seek licenses from rightsholders. While there may a case for Google to share some of its profits with rightsholders it is unclear that copyright law is the best way to do it. This law will extend beyond Youtube with unpredictable effects on internet activities, as clever lawyers cotton up to the new powers given to industry. This new power goes to the heart of internet regulation: the (lack of) liability of intermediaries that enables content to be hosted and linked around, expressed in the E-commerce Directive. In principle the new power covers services that go beyond providing "mere physical facilities" and perform and "act of communication to the public" by taking an active role in curating or promoting content, but this is not always clear cut. The Directive does not include an obligation to monitor preemptively - which would contravene other laws - but it forces the implementation of technological protection measures to protect works, such as Google's Content-ID - with transparency obligations towards rightsholders. There are some positive measures to protect creators that include transparency over online media sales, powers to renegotiate contracts and alternative dispute resolution mechanisms. Overall they seem positive albeit a bit weak, when compared with the sledgehammers given to news publishers and the music industry. These exceptions are positive but in all case limited when compared to the initial demands of libraries, educators and cultural institutions. They do not include many of the more far fetching reforms proposed by civil society and even the European Parliament. The call for a mandatory exception for "freedom of panorama" campaigned for by many civil society groups including ORG fell on deaf ears. The Commission has simply stated in their documents that the status quo works fine, while politely asking all countries to implement the exception. This exception allows the making of copies to perform analysis for scientific research by non-profit or public interest organisations. There is no compensation for rights holders and an explicit ban on contractual clauses overriding the exception. Technical measures to restrict access or copying are allowed but should not affect the exception. This is a positive move, although many research organisations and libraries had been asking for a broader scope as they feared that much important research may be excluded. The rationale for this exception is the lack of clarity on whether existing exceptions in Infosoc and Database Directive apply to online education, particularly cross border access . The exception covers only "educational establishments," which must control access to the resources, and will likely exclude many online educational initiatives. The exception allows for licensing schemes to take precedence over the exception and this could be used to weaken the provisions. Libraries, archives and similar cultural heritage institutions will be allowed to make necessary copies of works for preservation, but only of works in their permanent collections. The exception is only for internal copies and not for online libraries. A couple of fairly minor initiatives that are positive but of limited impact in the context of the once-in-twenty-years reform of copyright. Libraries have been lobbying for a long time to be allowed to engage in collective licensing deals to digitise and distribute out of commerce works. They see this as both an extension of their mission and an opportunity to generate funds, although in principle this is framed as non-commercial cost recovery of the costs of mass digitisation. The exception only applies to works first published in the EU. This is not a full free copying exception, but the option to enter extended collective licensing deals without the need to get approval from every author. There is a six month compulsory notice in case authors are around and object. The directive forces member states to create a voluntary "negotiation mechanism" with the support of and impartial body to help parties license work for VoD services. In summary, a disappointing culmination of a two year discussion that started with high hopes of seeing Europe take bold moves to really modernise copyright. The legislative process starts now however and while the UK is in the EU ORG will continue to try to influence the shape of these laws as they go through the European Parliament. We must also remember that this is all based on leaked documents and the European Commission may still make some changes. A just-leaked draft impact assessment on the modernization of European copyright rules could spell the end for many online services in Europe as we know them. The document's recommendations foreshadow new a EU Directive on copyright to be introduced later this year, that will ultimately bind each of the European Union's 28 member states. If these recommendations by the European Commission are put in place, Europe's Internet will never be the same, and these impacts are likely to reverberate around the world. The 182-page document identifies three general objectives--ensuring wider access to content, adapting copyright exceptions to the digital and cross-border environment, and achieving a well-functioning marketplace for copyright. In this initial article we examine the recommendations that fall under the third of these three objectives, which are amongst the most alarming proposals, including new obligations on Internet platforms, and new copyright-like powers for news publishers. More specifically, this article will look at two of the proposals for what the Commission calls "upstream" problems, or difficulties faced by copyright owners in extracting value from the use of content online. We'll deal with other parts of the document in later posts. The assumption that copyright owners should be entitled to share in any value created by online platforms is never really examined by the Commission. The theory is that because online platforms are doing rather well in the digital environment, and because traditional publishing industries are doing less well, this gives the publishers some kind of claim to share in the profits of the platforms. It's a questionable starting point, and as we'll see, the recommendations that flow from it are ill-considered and harmful. The first of the two problems that copyright owners supposedly face in extracting such value is that there is a large amount of user-generated content uploaded by users to sharing platforms, and that European law does not place an obligation on platforms to proactively police this content for possible copyright infringement, but instead relies on the latter to identify that the material has been uploaded without authorization and to request its removal. That existing law strikes a reasonable balance, similar to Section 512 of the Digital Millennium Copyright Act in the U.S.
Major entertainment companies characterize this as a problem because it means that copyright owners have less ability to ask online platforms to pay licensing fees for their content. In the case of user-generated content platforms (think YouTube and Soundcloud), the platform can simply offer to remove a copyright-owner's content rather than paying for it--or, in practice, to voluntarily offer a compromise such as YouTube's Content ID that automatically scans uploaded content and shares ad revenues for content identified as the copyright owner's. As for platforms that offer access to their own library of content (think Netflix and Spotify), rightsholders contend that they may be willing to pay less in order to remain competitive with the user-generated content platforms. In either case, major copyright holders contend that platforms should be paying them more for the content that the platforms make available online. The European Commission's proposed solution, however, is worse than the supposed problem. The Commission is proposing that user-generated content platforms should be forced to seek, in good faith, to conclude private agreements with copyright owners and to put in place "appropriate and proportionate content identification technologies". In short, the use of something like YouTube's Content ID system is being made compulsory. Automated systems, no matter how technically sophisticated, can never replace human judgment about whether user generated content infringes copyright. This is because copyright exceptions that exist in the United States (such as fair use) and in various forms across Europe (such as quotation, parody, and news reporting), mean that not every act of copying is an infringement. As a result, Content ID-type systems will inevitably misflag content, and wrongly allow a copyright claimant to monetize it or take it down. Content ID-type systems are extremely expensive. YouTube reportedly spent $60 million on the development of Content ID, but even if a new entrant would have to spend a small fraction of that on a similar system, that would still be an insurmountable obstacle to the majority of small and medium enterprises, and to non-profit organizations and users ranging from Wikipedia, all the way down to your brother who hosts a fanart messageboard on a desktop PC in his bedroom. More broadly, this kind of insidious regime of private agreements pushed by government is the kind of cop-out from good lawmaking that EFF calls "Shadow Regulation"; a concept that we'll be introducing in more depth in subsequent Deeplinks posts, where we will give some other examples of the same. But in short, such agreements can embody the worst of all possible approaches, by combining the coercion of government regulation, with the lack of accountability of corporate self-regulation. The European Commission doesn't stop there, but also has a similarly ham-fisted proposal to address the declining revenues of news publishers from their print publications, which leaves them with fewer resources to continue to invest in journalism. We have previously agreed that this is a real problem . But where the Commission errs is to pin responsibility for this problem on the reuse of news content by Web platforms under exceptions to copyright; and it compounds this error by seeking to limit their use of such copyright exceptions going forward. The Commission's proposal is to award publishers a new copyright-like veto power, layered on top of the copyright that already exists in the published content, allowing them to prevent the online reuse of news content even when a copyright exception applies . This veto power may last for as little as one year, or as many as 50--the Commission leaves this open for now. This kind of veto power has been described as a link tax --notwithstanding the Commission's protestations that it isn't one--because when the publisher controls even the use of small snippets of news text surrounding a hyperlink to the original article, it essentially amounts to a tax on that link. The result, as seen in Spain, will be the closure of online news portals , and a reduction in traffic to news publishers . A new wrinkle on this link tax proposal is that the Commission also proposes that publishers who have received a transfer of copyright from authors should also be entitled to collect revenue from whatever copyright levies member states may impose to "compensate" authors for use of their content under copyright exceptions. The notion that "compensation" is needed for users exercising their rights under copyright is a thoroughly perverse one, as we have previously explained . 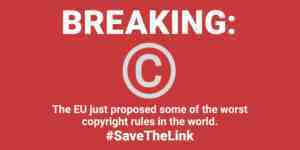 This addition to the link tax proposal is a gift to copyright collecting societies that will further increase the cost and complexity of lawfully reusing content. The impact assessment is not yet a draft law, but it is a crystal clear indication from the European Commission about the content of the law that is is proposing to develop as a draft for approval by the other European institutions, namely the European Parliament, and the Council of the European Union. Users will have further opportunities for input into the proposals when they reach that stage. But we'll have the best chance of stopping these misguided proposals if European officials are alerted to our concerns right away. They need to understand that Internet users won't accept the "Shadow Regulation" of intermediaries by requiring them to enter into expensive and error-prone arrangements with copyright owners for the automating flagging of user content. Neither will they accept a new "link tax" for news publishers that could stifle the dissemination of news online. Web-blocking is now fully up and running as an anti-piracy tactic in Norway, following a court ruling that orders ISPs in the country to block their customers from accessing eight piracy websites. Norway actually joined the web-block party with an initial ruling last year. The courts later made the initial injunction permanent confirming this is now a readily available option for copyright owners in Norway seeking to limit access to piracy sites. In 2014, the High Court ordered Sky, TalkTalk, BT, Virgin Media and EE to block websites dealing in counterfeit luxury products. The ISPs appealed the case on a number of grounds, including that the court had no power to order the injunctions. That appeal has now failed. In their appeal, the ISPs complained that they are innocent parties and that the Court had no jurisdiction to hand down a blocking order. However, even in the event that it did have jurisdiction, the ISPs said that certain thresholds required for an injunction had not been met. Continuing, the ISPs said that the judge had failed to apply the correct principles in deciding whether or not to hand down an order, and that the orders made were disproportionate. Finally, the judge should not have ordered the ISPs to foot the bill for blocking the infringing sites. This week the Court of Appeal handed down its long awaited decision and it's almost completely good news for the brand owners. Dismissing the ISPs' appeal, the Court said that High Court did indeed have the power to issue the blocking injunctions and that all the legal thresholds for doing so had been met. In my judgment the cost burden attributable to the implementation of a particular blocking order should fall upon the rightsholder making the application for it. In circumstances where valuable intangible rights of this kind need to be protected from abuse by others, I regard it as a natural incident of a business which consists of, or includes, the exploitation of such rights, to incur cost in their protection, to the extent that it cannot be reimbursed by appropriate orders against wrongdoers. But that doesn't mean that the ISPs are completely off the hook. Justice Briggs said that while the ISPs wouldn't have to pay the costs associated with implementing a blocking order, they would still have to foot the bill for designing and installing the software with which to do so whenever ordered. The UK Government's Digital Economy Bill, which is set to revamp current copyright legislation, has been introduced in Parliament. One of the most controversial changes is the increased maximum sentences for online copyright infringement. Despite public protest, the bill increased the maximum prison term five-fold, from two to ten years. The current maximum of two years is not enough to deter infringers, lawmakers argued. The plan followed a recommendation put forward in a study commissioned by the UK Intellectual Property Office (IPO) a few months earlier. This study concluded that criminal sanctions for online copyright infringement could be increased to bring them into line with related offenses, such as counterfeiting. Before implementing the changes the Government launched a public consultation, asking for comments and advice from the public. But, even though the vast majority of the responses urged the authorities not to up the prison term , lawmakers decided otherwise. The Government is proposing that people who breach copyright online should receive up to ten years in prison to bring sentencing in line with physical copyright theft. 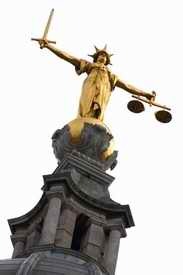 Copyright needs to be protected but the proposals could mean that individuals who share or link to files could receive custodial sentences -- even if they have not made any financial gain. This would be excessive and could mean that sharing a file online would lead to a greater custodial sentence than physical theft.